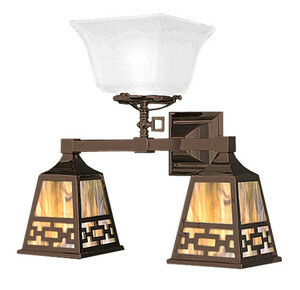 The late Victorian era had wider flame burners for gas, as seen by our 4" glass "up" shade fitter on this classic transitional lighting fixture. Electricity wasn't always reliable when it was introduced, however. Many fixtures offered both, and this is a particularly practical design. This chain design originated with Sechrist of Colorado, between 1910 - 1920. In addition to Mission style homes, it looks great in Arts & Crafts, Bungalow, and contemporary homes. 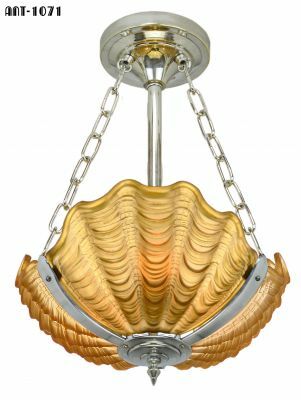 This would be a great hall light or bathroom light now, as it was then. Our Mission fixtures are made of solid brass, darkened to an "aged" finish. 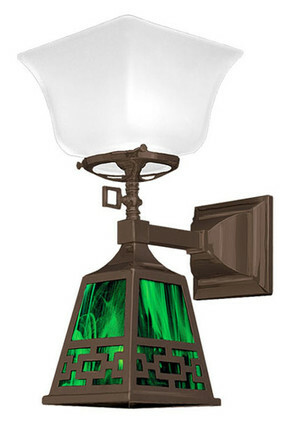 The glass shade for the "up", or gas fixture, is sold separately. 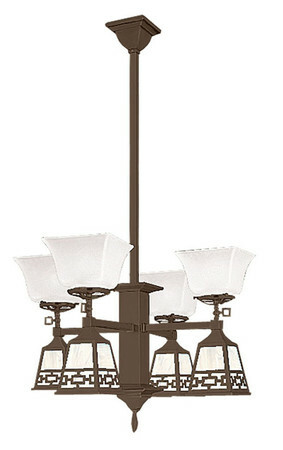 We offer 27 styles of 4" glass shades, including a short and a tall version of our simple Mission style frosted shade. If you'd like to add an on/off switch to the mounting canopy, we offer custom installation of the switch for only $25.00. Please click the "Yes" option on the "Add Switch?" menu above to add the switch to your cart. The "down" art glass shade is included in the purchase price. Please use the menu to select your favorite shade of art glass. Although the socket is rated well over 100 watts, we recommend a 60 - 75 watt incandescent bulb to protect the valuable art glass. Turn of the century bulbs weren't available in the higher wattage and thus heat. If you are using Compact Fluorescent bulbs, or our LED bulbs, you may use a higher wattage as they are cooler to the touch. Canopy Size: 4 ½" x 4 ½"; 3" deep. 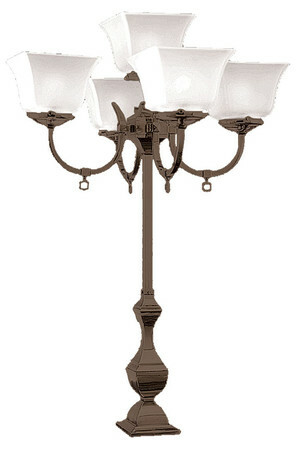 Up to 175 watts total: 100 watts "up", and 75 watts "down" if incandescent. These art glass shade holders are put together by hand; some slight imperfections may be noticed. This is how original Arts & Crafts fixtures were made.